I’m wrapping up my work for 2015, which is always a good chance to take stock of the hits and misses of the past year. This is something I think every freelancer should do: no matter how long you’ve been freelancing, you need to keep moving toward your long-term goals (or risk stagnation!). Following are some questions I think every freelancer should ask, and I’ll answer them here; feel free to add your own thoughts in the comments. And thanks very much to everyone who read and supported my blog this year. It’s up to about 1,200 view on an average day, and over 8,000 subscribers, which is exciting! Question 1: Are you happy with how much you earned, as compared to how much you worked? My 2015 answer: yes, but with some asterisks. When I was a newly-minted freelancer, I finished several years (definitely 2003 and 2004) feeling that I had worked way (way!) too hard for the amount of money I had made. Now, after 13 years of freelancing, I’m very happy with how much I earn, but my problem is that I want to do everything; and “everything” is way (way!) too much to fit into my available time and energy. Income-wise, I have a range of income that I consider “enough.” And as long as I earn within that range, I’m satisfied. It gives me a similar level of financial security to someone with a traditional job; it allows me to invest in my business by attending conferences, buying new office equipment and participating in professional development. It allows me to take enough time off that I feel excited to come back to work after a vacation. It’s enough. My problem is that there’s a bottomless pit of interesting projects that I’d like to take on, and I have to limit myself to what I can realistically do an excellent job on. Question 2: What were the highlights? Happily, this year had many highlights. To sum it up in one sentence, I translated three books (just submitted the third manuscript on Friday! ), published the third edition of How to Succeed as a Freelance Translator, and was elected President-Elect of ATA. Definitely some items crossed off the bucket list there; and best of all, I felt happy and energized during nearly every moment of all of those projects. Several of my clients also landed big projects of their own this year, and those were very rewarding to be involved in. Question 3: Any low points? And there are always challenges and dilemmas. 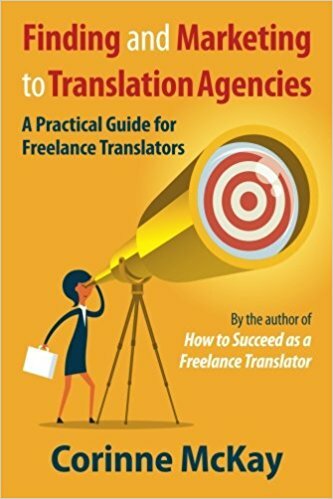 I’m currently earning about 1/3 of my income from agencies and individuals, 1/3 from direct clients and 1/3 from my online courses, book royalties and consulting; let’s call those “information products.” The challenge/dilemma is that there’s a huge market for information products for translators; enough that I would venture a guess that if I wanted to quit translating and only develop information products for translators, I could. And I *love* teaching and writing. However, I still want to be a translator, not someone who simply pontificates from afar about what other translators should do. It’s a dilemma. Question 4: Did you do something that challenged you? This is a resounding “yes” this year. I hate the thought of stagnation, so I really try to do something challenging every year. Branching out into translating books, something I’ve been working on for many years, has been both hugely challenging and hugely rewarding. In addition to the murder mystery I translated for a self-published author, I translated two mountaineering biographies for an outdoor book publisher (more on those when they’re published); I’m an avid mountain sports person in my spare time, so this allowed me to combine something that I’m personally very interested in with my translation skills. I’m a big believer in setting goals for the the short term and the long term, and the very long term. In the short-ish term, I’m excited about the new online courses I’ll be teaching this winter and spring, and I’m excited to start marketing the new edition of my book once it’s in the major distribution channels. This year, I’ve also had a growing sense that in the long term, I’d like to move toward work that is still as demanding as what I do now, but that is less immediately deadline-driven. In concrete terms, if I had to envision what I’d like to be doing in seven or ten years, I’d like to focus on translating books and teaching, so that I can be more location-independent and more flexible with my schedule. But right now, to sum it up in two words, I’m happy! Thanks again readers, and over to you! I really appreciate your thought about freelancers. Thanks for another great year, Corinne! I have a feeling that 2016 will be nothing but fantastic for all the translators across the globe. I hope that all of us will focus on the positive sides and this will help us reach new heights in our careers and be happy! Merry Christmas to you and your family and Happy New Year! Your “Annual Wrapping up the year” column is always valued! And a great starting point for answering the 5 questions you pose above, is to get started on an analysis of one’s 2015 assignments, as part of pulling together all that’s needed for 2015 tax reports. In my early years as a translator and interpreter (also started in the early 2000’s, Corinne! ), I did a lousy job tracking my income, how hard I worked for it (often at lousy rates), how much(A LOT!) I expended on HW, SW & speciality dictionary investments. Happily, I have made great strides since. And income has steadily grown every year to have reached a comfortable middle class income (no, I will probably never be one of those few T/I’s who will make a 6-figure income, but I’m OK with that). Because as a freelancer I treasure the flexibility to take time off to care of family members, do volunteer service (enriching in itself). Which is more than I can say for my husband, who is an media engineer working for a Pentagon contractor which only offers only 10 days of leave a year (to cover both vacation and sick leave! ), Hard to get him to take vacations, especially when these DOD contracts last only 5 years, and he never knows whether DOD will renew his employer’s contract (overdue for renewal now)! So he saves those few precious leave days up as a rainy day fund! I always find it astonishing that there apparently are more federal contract employees than there are federal employees! As always, I am in awe of how you have diversified your translation portfolio, into literary translation, publishing books, teaching and writing a great weekly blog, plus serving on the ATA board of directors. Keep writing, Corinne! And thank for your service to ATA.